California Traveler: Artichokes Are In Season! To me, the artichoke is a quintessentially Californian vegetable. The California climate is uniquely suited to growing this Mediterranean thistle and nearly 100% of the artichokes in the U.S. are grown in California (the majority of which are grown in Monterey County). I love artichokes, especially fresh artichokes. So, I'm quite excited that April is the peak month in the prime globe artichoke growing season. Tonight I prepared grilled artichokes for dinner (pictured above). 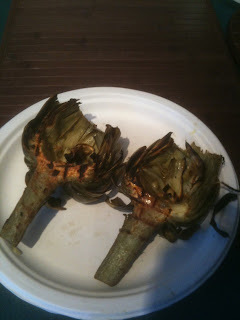 This is not the first time I fixed artichokes, but it is the first time I grilled them. They were delicious! I plan to have them tomorrow night too, and as often as I can get fabulous, fresh artichokes. When visiting Monterey County you will find many restaurants featuring Castroville artichokes, so make sure to try them...you'll definitely like them. For some great tips on preparing artichokes and recipes, visit the largest grower of fresh artichokes in the U.S., Ocean Mist Farms.